Sinusitis Home Remedy Relieve Sinus Infections Faster | Max-Air Nose Cones ® | Sinus Cones ® Official Site - ultimate breathing | snoring relief for the sleep of your dreams. 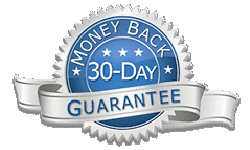 Amazing home remedy, 100% NATURAL, fast-acting Sinusitis Remedy – clears sinus infections, relieves sinus nasal congestion and sinusitis reliably overnight. If you are seeking MORE POWERFUL, DRUG-FREE sinus congestion relief, physician-recommended Sinus Cones may be just what you need. I have been using the Sinus Cones for over a year now, and they have been a tremendous life changer. I had been suffering with chronic sinusitis since 1999. I was constantly at the doctors in need of antibiotics to treat the sinus infections and I was on pain medication too because the sinusitis pain was so great. Sinus Cones decongest sinuses at the source of the problem, inside the nasal passageways. Sinus Cones help correct impaired breathing due to sinus nasal congestion by gently and comfortably stenting open the nasal airway to maximize nasal airflow. Maximized nasal airflow is the key to helping sinuses drain correctly. The flow of air through the nasal passages, literally causes nasal congestion to pass more quickly through the nasal airways so that it does not build up and cause the sinuses to block, swell and infect. Sinus Cones are specifically designed to comfortably and reliably open the airways faster than medications, thereby maximizing airflow and its healing powers, immediately. No need to wait to inhale. Start relieving sinusitis (chronic sinus infections), acute sinus infections, or just that bothersome nightly sinus congestion better, naturally. And, unlike medications or nasal sprays that can wear off during the night and cause congestion to build up, the Sinus Cones are a soft device (like a contact lens) so they keep working all night long. Breathe in more easily and sleep more deeply any night you choose. 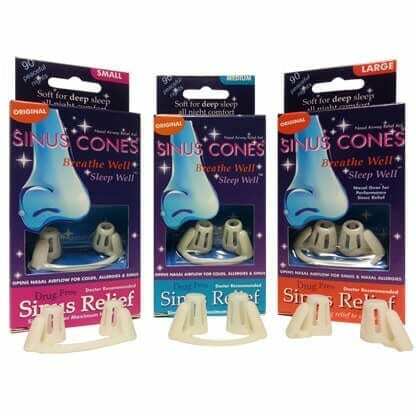 Sinus Cones start to work immediately to relieve blocked sinuses fast. 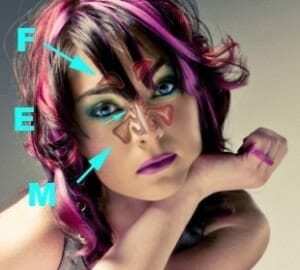 Feel improved breathing volume as soon as you place them in your nose. They’re 100% drug-free, maximum-strength and amazingly effective. Why suffer any longer? Order today! Maximizing airflow through the nasal airways is key to sinus health. Nasal airflow is what keeps sinuses clear and healthy. When nasal congestion from a cold or nasal allergies obstruct the nasal airways and reduce nasal airflow, the sinus cavities cannot drain and clear themselves properly and a sinus infection typically results. So, when you want sinus congestion relief, and you want it fast and you want it to last (but not cause side effects, disturb your sleep or make you groggy in the morning) try Sinus Cones. By comfortably creating a “clear-tunnel” breathing pathway, Sinus Cones maximize airflow to help sinuses clear and drain fast. Feel the airway difference instantly, while the healing airflow ventilates and clears congested sinuses, naturally. Hi. Just wanted to let you know that I got the Sinus Cones yesterday and they are AMAZING. I’m pregnant and my sinus problems (which I’ve had my whole life) have been making me extra miserable for the last 4 months. Although my doctor said that some medications (decongestants, steroid sprays) are safe to use, I feel really guilty taking anything so I’ve just been suffering through the entire pregnancy, using only saline spray (which, I’m convinced, does nothing if you’re seriously congested). Sinus Cones are drug-free and all natural (we like to think of it as going “GREEN” with your sinus relief) so they are safe to use with antibiotics with no risk of side effects. Sinus Cones are also helpful if you have hypertension and shouldn’t use decongestants due to their risk of elevating blood pressure. TIP: Use Sinus Cones at the first hint of sinus congestion to prevent congestion build up and sinus infection recurrence, or avoid complications from a cold. Sinus Cones are soft, yet resilient enough to tackle the toughest congestion. Because Sinus Cones work from the inside they are more powerful than other relief aids, and best of all the relief does not wear off, especially while sleeping. Soft, yet firm enough to comfortably stent open airways, Sinus Cones are simple to insert, safe, physician recommended and 100% natural. What is the most common reason for recurring sinus infections? The most common cause of sinusitis, recurring sinus infections, is lingering nasal congestion. Whether congestion is due to the common cold, nasal allergies or nasal obstruction such as a deviated septum the outcome is the same. When nasal mucosa lining becomes over-burdened by germs, allergens or a virus and nasal airflow is impeded due to the resulting swelling and nasal congestion, the mucosa loses its viscosity and starts to clog up. As the mucosa clogs, the ostia (the small sinus openings that ventilate the sinuses and allow them to drain) become blocked, and normal sinus ventilation and sinus drainage is not possible. Once the sinuses stop draining, they swell causing sinus pressure and triggering the development of a sinus infection. As shown in this picture, the pairs of sinus cavities surround the nose and eyes. Healthy sinuses are shown to the left, and inflamed, blocked and swollen sinuses to the right. Symptoms of sinus infections include sinus pressure and sinus swelling. It is easy to see that anytime sinuses are swollen or blocked, pressure and discomfort builds around the eyes and nose. Sinus congestion can sometimes be “dry”. In other words, there is no nasal discharge just a feeling of stuffiness and congestion in nasal airways and maxillary sinuses. Sinus congestion can be a symptom of the sinuses starting to block and swell; a common occurrence before sinuses swell and become a full blown sinus infection. By using Sinus Cones at the first hint of this stuffiness, nasal passages are opened so that nasal airflow is normalized and healthy sinus ventilation is maintained. In many sinus sufferers, especially those with repeated infection, there may be one of more preexisting conditions that contribute to the problem – a deviated septum, nasal polyps, or allergies. All of these cause narrowing of the nasal passages, and blockage of the sinus openings, which increase the chances of a viral cold progressing to a full-blown sinus infection. Some people get severe sinus attacks following airplane flights because of underlying problems with nasal drainage. When you fly, you experience changes in air pressure. Pressure changes can cause swelling of the sinus membranes and lead to inflammation and, at times, to infection. If you have a cold, these problems become worse. If you are restricted from using decongestants or sprays, Sinus Cones relieve the stuffiness by opening the nasal passages, so that airflow is unhindered, preventing sinus flare-ups. Why not try Sinus Cones?